The challenge was to make things that are in the air- I decided to use Butterflies and they are a symbol for happiness. I enjoyed making this card.I added color to a Quic kutz embossing folder and embossed the white cardstock. I used the debossed side. Love how it came out. I followed the sketch very closely for this one as it was very different. I added the saying vertically. 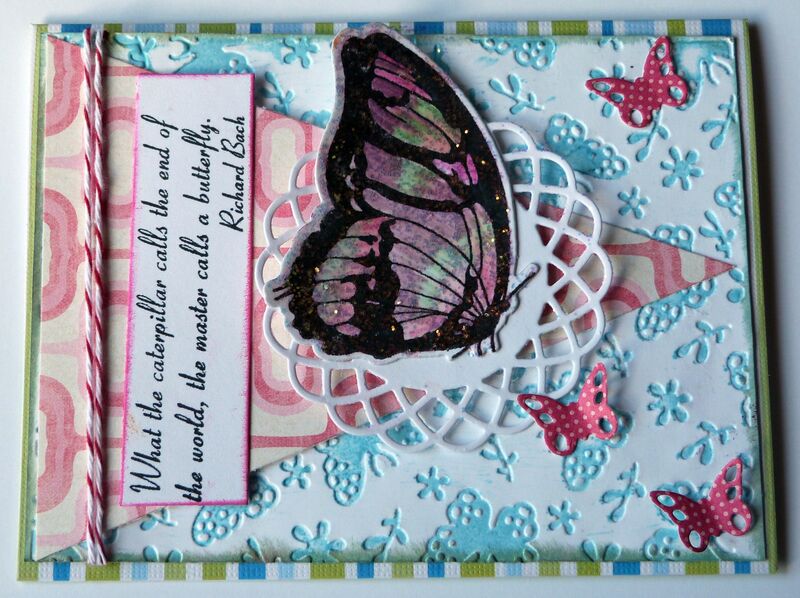 I cut and stamped the beautiful butterfly from MFT. I then colored it with a brush and distress inks. The small butterflies are dies from the notched tag at MFT. I added some twine and stickles to the butterfly, it really shines. Lovely card, fabulous butterfly! Unfortunately to be considered for our challenge at ATS&M we ask that you enter your card in a maximum of 5 challenges only. We’d love to see you play along next week. This is beautiful. Love the stickles on the butterfly. Thank you for sharing this with us at Dream Valley Challenges. Gorgeously coloured butterfly. Thanks for sharing your lovely card with us at ATS&M this week. Gorgeous card. I absolutely adore the sentiment you’ve used. Thanks for joining us at Robyn’s Fetish Challenge this week.